The apartment occupies the entire ground floor of an old Venetian palace. It is situated firstline to the sea in the historic fishing village of Prcanj and benefits from its own private terrace and a punta (jetty). The latter has mooring for a boat up to 48 foot. There is also a small pebble beach suitable for children who prefer not to step down into the sea from the punta. The palace has been extensively renovated and is furnished in a luxurious contemporary style whilst the historic character is maintained. There is a large open plan sitting, dining and kitchen area. There are two bedrooms and two bathrooms. Pranj is sandwiched between the crystal clear water of the Boka Kotorska and its fjord mountains. It is approximately 10 minutes from the UNESCO heritage town of Kotor which can be reached from Prcanj by either boat or road. There is a mini market approximately 50 metres from the property and a number of splendid cafes and restaurants within a short walking distance. We are a professional couple with two children who fell in love with Montenegro when we first visited in 2007. We wanted an old property first line to the sea and were very excited when we found the ground floor of our palace as it was a shell and working with the builder we suggested how we wanted it. We wanted to create a baroque/modern feel with the best quality building materials we could find locally. We scoured the area for tiles and furniture. We hope you like the main bathroom with the marble walls running into the original stone. The bed in the main bedroom came from Italy and our daughters call it the Princess bed. 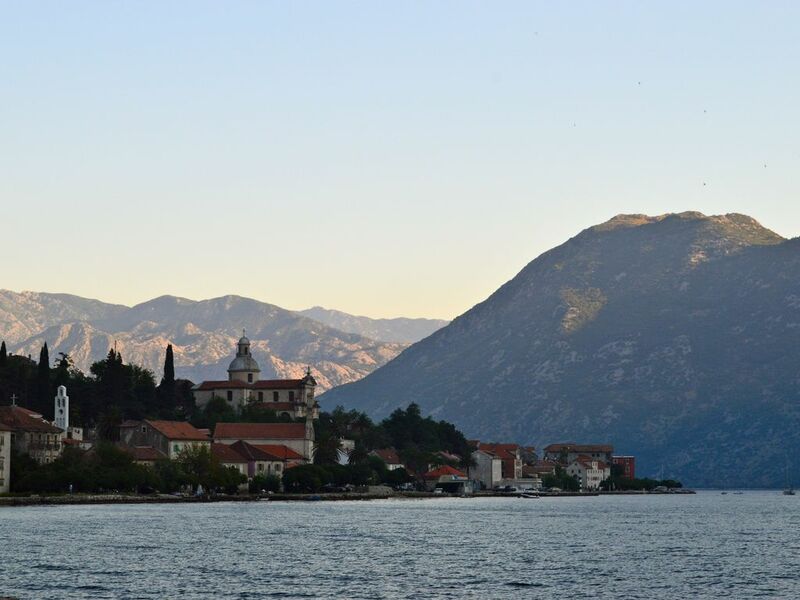 What do we most love about Montenegro? Being picked up in the morning by Nikoli in his boat and having a day swimming in the Boka! Most definitely the view. Then breakfast on the terrace, being able to dive off our own punta (jetty) the friendliness of the people, the amazing food, the weather. Having the mini market just within a few yards is also great and if we have friends with young children they can go into the shallow water just beside the jetty and paddle. Family bathroom with bath/shower over, wc, sink with large mirror over, washer/dryer. En-suite bathroom to bedroom 1. Bath/shower over, wc, sink with large mirror over. Large living area with large comfortable modular leather sofa. Contemporary dining table with leather dining chairs (6). Door access to terrace and punta. Fully fitted with granite tops, hob, oven, large fridge freezer, dishwasher, crockery, cutlery, glassware and cooking utensils. In addition there are plastic plates for eating on the punta. Available to charter or hire. Notes on accommodation: Both bedrooms have room for travel cots or additional inflatable beds for children. Sun loungers for use on punta or terrace. Very suitable for children however as with all villages on the boka there is a small road between the house and the punta. Outside: Terrace outside with lockable gate to beach and punta. Sun loungers provided. Punta/jetty with mooring for boat up to 48 foot. Cleaning / Towels / Linen / Maid service: Clean linen, towels are provided and changed weekly. Additional change are available at an extra cost. Welcome hamper on arrival. Maid service available. Prcanj is from a time long gone our son who was 15 at the time had never seen anything like it! That said it was charming & it really felt like a get away from it all holiday. The apartment was roomy and had everything we needed for a comfortable stay. The punta was amazing, our play thing by day and restaurant by night. Candle lit suppers as we watched the world go by on land and water. Kotor was very close and very buzzing for those who like things more lively but we loved the sleepy feel of Prcanj, the views are some of the best we have ever had. That said there is no shortage of grocery stores and restaurants. It felt like the bakery never shut, fresh bread all day long, fantastic! The apartment is very spacious with superb decor as well as practicalities taken care of (plenty of cutlery, glasses, plates etc.). The main room is well laid out and allowed for enjoyable evenings in. Outside there are two restaurants very close by (both serving very nice food) and a convenient little store also just next door. Although these establishments are very close I never noticed any loud noise coming from them into the apartment. There is a wonderful bakery about a 10 minute walk away that sells very nice bread and pastries. The walk to Kotor (the nearest town) is about 40 minutes at a leisurely pace with a few more restaurants on the way. The walk is lovely and has fantastic views of the water the whole way along. The itself has many larger supermarkets as well as traditional markets selling fresh fish and veg etc. The old town is full of nice restaurants and a walk up the town walls is highly recommended for the wonderful views it provides at the top. Swimming (or kayaking) is very easy as access to the water is right outside the apartment. The bedrooms are very comfortable and the bathrooms have all the appropriate facilities (washing machine/dryer, ironing board etc.). Overall a wonderful stay. Palazzo Lucovic was a special place to have stayed. The apartment exceeded our expectations, it was very comfortable, spacious and met our needs in every way. The location of the Palazzo, and the use of the punta made the stay even more enjoyable and the village was perfect for us. It is a truly lovely village, and it made a great base for us both for walking locally and kayaking. We also visited and explored (amongst other places) Lovćen National Park several times and we bowled over by its beauty and majesty. The 25 hair pin bends on the way up to that area made for an exciting and breath taking journey. We were particularly well looked after by the staff at Boka Bay restaurant, they could not have been kinder or more helpful, and we had delicious meal there. Furthermore, the neighbours to the property were so helpful and generous and again this made our stay in Prćanj special. We rented kayaks (from Bobo) and spent 6 days thoroughly enjoyable and memorable days kayaking to the local villages along the coastline of Kotor Bay. Bobo was very friendly, informative, generous and helpful. Even managed to do some food shopping from the market in Kotor and paddle it back to the Palazzo…..fancy my next trip to the supermarket will feel even blander than usual! Thank you again. This first trip to Montenegro was very special and it has inspired to visit again. This place is located right on the water he water with a nice punt for enjoying a peaceful cup of coffee in the morning. Kotor is about 5 minutes by car and Tivat is just 20 minutes by car. There is a tavern next door, a well stocked market 1 minute walk away and a bakery about 5 minutes walk away. Great spot. Property was beautiful and well situated. Accommodation was everything we had hoped for, spotlessly clean, spacious, and well prepared, with welcoming bits and pieces as an added delight. We thoroughly enjoyed our stay in Montenegro and found this beautiful property a superb base for exploration of the area.We had been given good advice where to visit and what to see. We had also been recommended the best restaurants in the area. We would recommend it to anyone, and will definitely return. The property was amazing and situated right overlooking the Fjord. Accommodation was spacious with spectacular views - we were lucky enough to have wonderful weather and we were able to sit and look at the mountains and the cruise ships sailing by as we ate our meal. There was a good restaurant situated next door, so no worry about getting home! We love walking and we regularly walked into nearby Kotor. Very conveniently placed for exploring the area - taxis very reasonable. We were welcomed with fresh fruit, fresh bread, chocolates and a bottle of wine! We were advised of the best local restaurants, bakery and supermarkets. Lots of information on the area in Apartment. Highly recommended, we would certainly visit again. Owner could not do enough for us. Nature lovers check out Skadar Lake and Lovcen National Park. Foodies will enjoy the local food which is fresh and mostly organic. Fish is particularly good and some local wines are excellent. There are a number of other activities that can be booked such as sailing, white water rafting, forest and lake hikes, kayaking. Details can be sent on booking. Apart from small beach directly beside the property there are a number of other beaches close by. Most can be reached within 20 -30 mins. Further afield there are Budva and Sveti Stefan resorts. Kotor is 10 minutes away. Budva is approximately 35-40 minutes. There are numerous leisure activities available such as sailing, mountain climbing, white water rafting, tennis. Boats can be chartered for use during your stay. The historic UNESCO heritage town of Kotor is 10 minutes away and Perast is approximately 30 minutes away by car or boat. Booking Notes: Bookings can be made by contacting the owner directly. A 25% deposit must be paid at the time of booking. Full payment must be received 8 weeks prior to departure. Changeover Day: Flexible. Preferably weekend in high season. Shorter lets available - please phone to discuss. Notes on prices: Prices are for the property per week in UK pounds. Shorter stays available depending on availability - please contact owner.